I thought I would post a couple pictures of the quilt currently on my frame. It is a Thimbleberries Scrapathon quilt made out of Thimbleberries fabric. 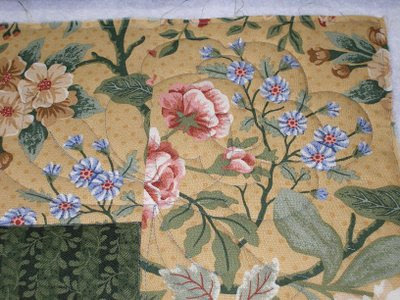 The fabric in the border has a lot of different flowers in it. I decide to quilt roses in the outer border. Here is a shot of the one of the corners. 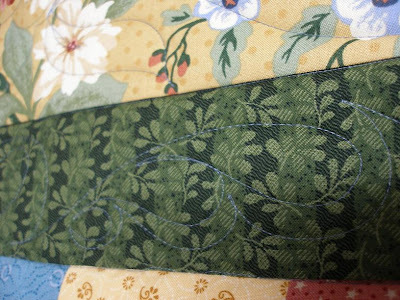 In the green inner border I am quilting a feather and swirl design. I will be doing Whimsy with Roses in the body of the quilt. The backing is blue, which is why I chose blue thread. It is So Fine thread and is a light denim color.